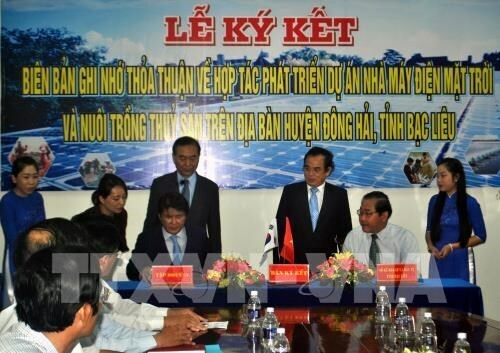 Bac Lieu (VNA) – The Department of the Planning and Investment of Bac Lieu province signed a Memorandum of Understanding with the Republic of Korea-based SY group to build a solar power project in Dong Hai district. Under the MoU, the SY Group will construct a 400-hectare solar power plant in Long Dien commune, Dong Hai district of the Mekong Delta province from 2017 to June 2019 with a total investment of more than 10.24 trillion VND, or over 450.5 million USD. The first phase of the project will have a capacity of 50 MW while the second will bring the capacity up to 300 MW. It is the biggest solar energy project in Vietnam so far, said the group’s chairman Hong Young Don. Once completed, it will help boost the local social-economic development, he added.